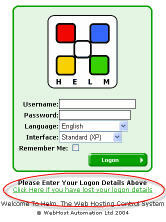 DigiServ Technologies cc - Knowledgebase - I forgot my Helm login information. How do I log in? Portal Home > Knowledgebase > Windows Hosting > Windows (Helm USA) > General > I forgot my Helm login information. How do I log in? Please visit the Helm login page at http://207.170.65.106/ and click the "Click here if you have lost your login details" link. Alternatively, you can click here to go directly to the lost password page. Enter the e-mail address you have on file in your Helm profile, then click "Submit." You will be sent a randomly generated password to the e-mail address you specified. Once you log back in with this information, you can change your Helm password back to whatever you want. Keep in mind this only changes the Helm password and none of the passwords for your other services (such as FTP, mail, etc). If you still have problems, please submit a support ticket and we will help you get logged back in.